Tito Rabat has won for the second time in Moto2™, pulling a late pass on Takaaki Nakagami to triumph in Sunday’s Red Bull Indianapolis Grand Prix. Following another spirited battle, Scott Redding increased his title-leading advantage by beating Pol Espargaro to the final podium position. 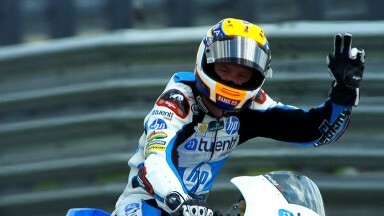 Victory for Rabat is the Spaniard’s second after Jerez earlier this year. 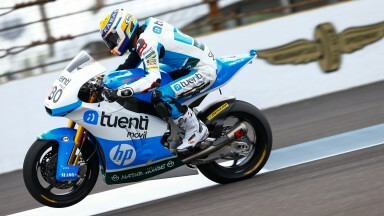 The Tuenti HP 40 rider – teammate to Espargaro – came from fourth place on the grid, having run fifth in the opening stages of the race. His other teammate, Axel Pons, did not make the start (due to a fever) which left 32 riders on the grid. A strong getaway for pole-sitter Redding allowed the Englishman (Marc VDS Racing Team) to fend off Espargaro and lead into the first corner. Nakagami (Italtrans Racing Team) was third, but pulled a strong manoeuvre on Espargaro to seize second spot at Turn 10. On the second lap, Nakagami stole the lead from Redding and – pushing for a first win – would not lose the top spot until Lap 23. Rabat’s charge came very much in the second half of the race, first overhauling Redding on Lap 19 before carrying out a confident pass on teammate Espargaro two laps later. The move for the lead came at Turn 1 on the 23rd lap of 25, denying Nakagami his career-first victory. Behind, Espargaro – who had started second to Redding – fought his major rival, but ran wide at the second corner and was forced to fend off Technomag carXpert’s Dominique Aegerter for the rest of the race. Positions six to ten were filled by Simone Corsi (NGM Mobile Racing), Mika Kallio (Marc VDS Racing Team), Johann Zarco (Came Iodaracing Project), Xavier Simeon (Maptaq SAG Zelos Team) and Sachsenring race winner Jordi Torres (Aspar Team Moto2). Blusens Avintia’s Kyle Smith was the only faller, crashing out on Lap 12. Heading to Brno and the Czech round of the World Championship next weekend, Redding’s championship lead over Espargaro has been stretched out to 26 points, with 159 versus 133. Today’s race winner Rabat (113 points) remains third in the standings, now the reduced margin of 46 points in arrears of Redding.